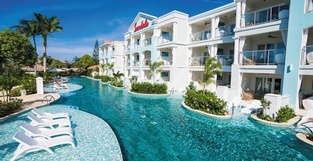 Due to the popularity of the Caribbean’s first-ever Over-the-Water Villas, Sandals Resorts announces 12 additional Over-the-Water Bungalows at Sandals Royal Caribbean. The new Over-the-Water Private Island Butler Honeymoon Bungalow room categories will be available for sale immediately for arrivals beginning February 1st, 2017. 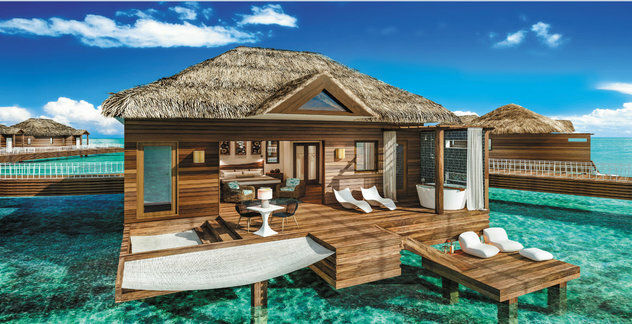 These gorgeous over-the-water bungalows will feature glass vision floor panels and lit water with underwater views at any time, day or night. Admire the beauty of the ocean from you very own private outdoor Tranquility Soaking Tub or have a relaxing swing in the over-water hammock. 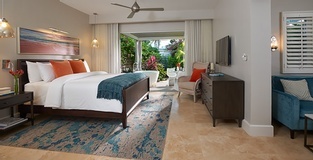 Every bungalow boasts hardwood floors, vaulted ceilings, custom crafted king-size beds adorned with soft linens and plush pillows for the ultimate sleep experience. Inside, is your personal smart TV, with a large ceiling fan and bathrooms with his and hers sinks, a large backlit mirror adorned with mosaic tile, and a walk-in rain shower. Step outside on the private patio with an extended sun deck, outdoor shower, sun loungers, and a bistro set for two. And of course you can't have this experience without your own private butler to meet your every wish and command, including 24 hour room service, and a private water taxi to take you to and from the resort. Starting at $2,652, these bungalows can be booked for travel today. 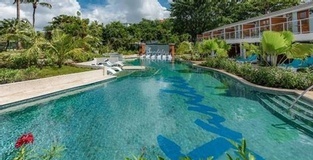 For more information, please visit www.sandals.com.